This Sabatier International 5 piece knife block set comes with a 9cm Paring Knife, 13cm Serrated Utility Knife, 20cm Carving Knife, 20cm Bread Knife and 20cm Cooks Knife plus an elegant and attractive knife block to house them in. Manufactured to the exacting standards demanded by the Lion Sabatier factory in Thiers, France. Rousselon Dumas-Sabatier who have been manufacturing Sabatier knives since 1812 are one of the most famous and well known knife manufacturers in France. These high quality knives are perfect for use at home, are easy to handle and equally as easy to sharpen. Comfortable contoured handles shaped to fit with your hand perfectly. Made from 4Cr13 stainless steel, these knives have a strong, sharp cutting edge with triple rivet handle and beautiful black finish thats contrasts perfectly with the steel of the blade. 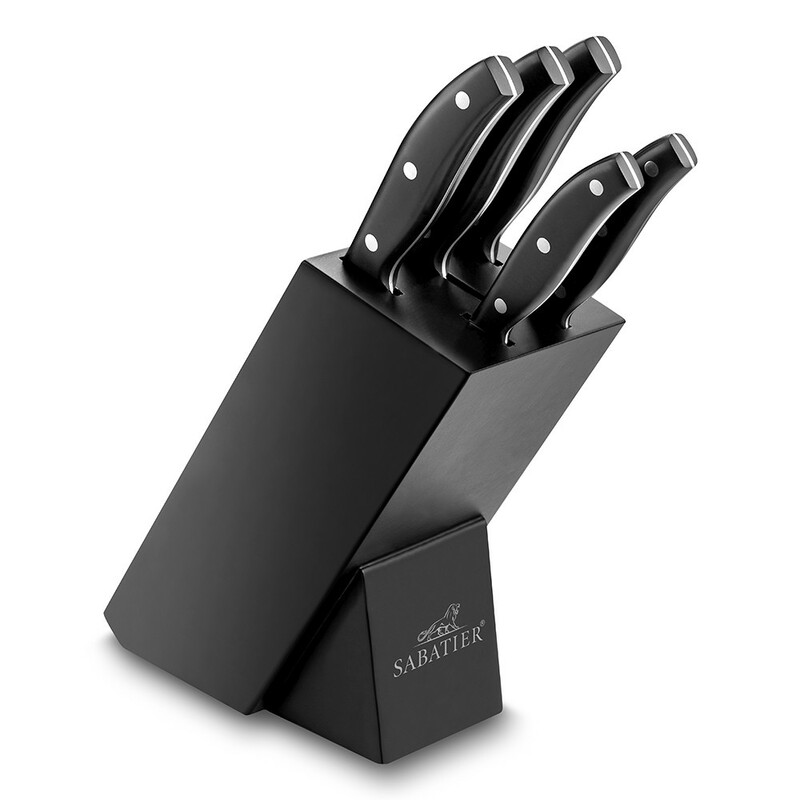 The Sabatier International 5 piece knife block set comes with a 9cm Paring Knife, 13cm Serrated Utility Knife, 20cm Carving Knife, 20cm Bread Knife and 20cm Cooks Knife plus an elegant and attractive knife block to house them in. This knife block set gives you all the evryday knives you need at an amazing price. With their elegant black handle and three stainless steel rivets this 5 piece set gives you all of the most commonly used knives in one set. In addition to this in the package is the attractive knife block allowing you store all yours knives safely without dulling the blades by keeping them in a drawer. These Sabatier International knives will be the mainstay of your kitchen.